Gougeres are easy. They are also delicious, and can be seasoned and stuffed in so many ways. 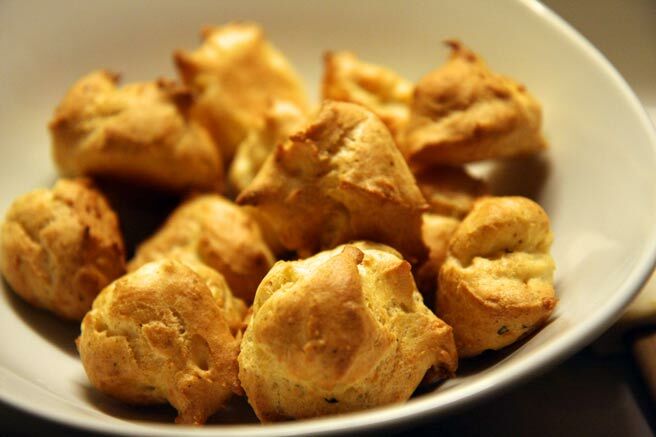 The next time you have guests, whip up some gougeres to go with the aperetif. They are a great way to say you care and much less expensive than gourmet snacks or nuts! I estimate that making a batch of gougeres which yields about 3 dozen bite sized cheese puffs costs approximately €1,70, and you don't have to buy anything special in order to make them. Choux paste is seasoned with my house spices and whatever cheese I have on hand, to make a welcoming start to a meal. They go perfectly well with a Chablis, or a Clairette, Cremant, or Champagne. Mix your flour, spice mix, and nutmeg together and have it ready to use. Put the fat and salt into a saucepan with the water. Bring to a rolling boil. Add the flour mixture, all at once. Beat vigorously by hand with a wooden spoon over the heat until the dough begins to separate from the edge of the pan, having lost some moisture. Remove from the heat and incorporate the first egg fully with the wooden spoon, then the second. Mix in the grated cheese. Place rounded teaspoon-fulls on a cookie sheet lined with parchment. Bake at 210 C / 400 F until they turn golden brown. Turn off and open the oven slightly to keep them warm until service. Note of thanks to the reader who kindly prompted me to keep my ml and cl's straight!